The LSN Company Platform is the premier life science company database, covering emerging biotech & medtech company profiles, product pipelines, licensing opportunities, financing rounds, technologies, licensing deals and management details. The Life Science Nation Company Platform is the premier life science company database, covering emerging biotech & medtech company profiles, product pipelines, licensing opportunities, financing rounds, technologies, licensing deals and management details. The LSN Company platform has a particular focus on the bottom third of the market that is missed by traditional data providers. This makes it the most comprehensive database of its kind. The LSN Company Platform provides unprecedented visibility on over 40,000 companies around the world. 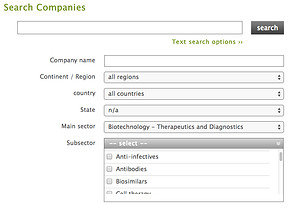 LSN’s proprietary search ontology allows business development executives to efficiently and intuitively identify a target list of companies that are a fit for their criteria – all in just a few clicks. The platform provides functionality to further increase the efficiency of searching for companies of best fit. This includes the ability to bookmark companies, download or print profiles, download or export search results, and set up automatic email alerts.